English actor Boris Karloff (William Henry Pratt) was born 23 November 1887. Karloff is best remembered for his roles in horror films and his portrayal of Frankenstein’s monster in Frankenstein (1931), Bride of Frankenstein (1935), and Son of Frankenstein (1939). His popularity following Frankenstein was such that for a brief time he was billed simply as “Karloff” or “Karloff the Uncanny.” His best-known non-horror role is as the Grinch, as well as the narrator, in the animated television special of Dr. Seuss’s How the Grinch Stole Christmas! (1966). Karloff grew up in Enfield & attended Enfield Grammar School before moving to Uppingham School and Merchant Taylors’ School, and King’s College London where he studied to go into the consular service. He dropped out in 1909 and worked as a farm labourer and did various odd jobs until he happened into acting. His brother, Sir John Thomas Pratt, became a distinguished British diplomat. Karloff was bow-legged, had a lisp, and stuttered as a young boy. He conquered his stutter, but not his lisp, which was noticeable all through his career. In 1909, Pratt travelled to Canada and began appearing in stage shows throughout the country; and some time later changed his professional name to “Boris Karloff”. Some have theorized that he took the stage name from a mad scientist character in the novel The Drums of Jeopardy called “Boris Karlov”. Karloff joined the Jeanne Russell Company in 1911 and performed in towns like Kamloops, British Columbia and Prince Albert, Saskatchewan. After the devastating Regina, Saskatchewan, cyclone of 30 June 1912, Karloff and other performers helped with cleanup efforts. He later took a job as a railway baggage handler and joined the Harry St. Clair Co. that performed in Minot, North Dakota. Once Karloff arrived in Hollywood in 1918, he made dozens of silent films, such as The Masked Rider (1919), The Hope Diamond Mystery (1920), King of the Wild (1930) and The Criminal Code (1931), a prison drama in which he reprised a dramatic part he had played on stage. Another significant role was an unethical newspaper reporter in Five Star Final, a harshly critical film about tabloid journalism which was nominated for an Oscar as Best Picture of 1931-32. 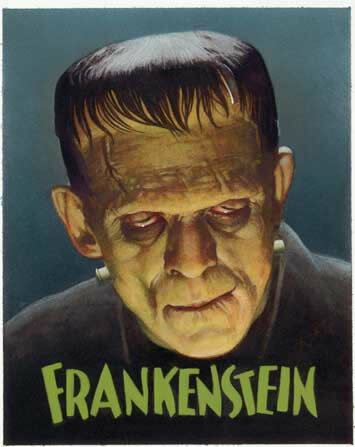 However it was His role as the Frankenstein monster in Frankenstein (1931) which made Karloff a star. A year later, Karloff played another iconic character, Imhotep in The Mummy. The Old Dark House (with Charles Laughton) and the starring role in The Mask of Fu Manchu quickly followed. These films all confirmed Karloff’s new-found stardom and In 1933, he went back to Britain to make The Ghoul. Karloff appeared in other films besides horror. including the 1932 film Scarface and the 1934 John Ford epic The Lost Patrol.However, horror remained Karloff’s primary genre, and he appeared in many 1930s Universal horror films, including several with Bela Lugosi, his main rival as heir to Lon Chaney, Sr.’s status as the top horror film star. After earning fame in Frankenstein, Karloff appeared as the Frankenstein monster in two other films, The Bride Of Frankenstein in 1935 and The Son Of Frankenstein in 1939, with the latter also featuring Lugosi. Karloff also starred as the villainous Dr. Niemann in House of Frankenstein (1944). Karloff returned to the role of the “mad scientist” in 1958’s Frankenstein 1970, as Baron Victor von Frankenstein II, the grandson of the original inventor. The long, creative partnership between Karloff and Lugosi produced some of the actors’ most revered and enduring productions, beginning with The Black Cat. Follow-ups included Gift of Gab (1934), The Raven (1935), The Invisible Ray (1936), Black Friday (1940), You’ll Find Out (also 1940), and The Body Snatcher (1945) & Tower of London (1939). From 1945 t0 1946 Karloff also appeared in Isle Of The Dead, The Body Snatcher, and Bedlam. Karloff ended his career by appearing in four low-budget Mexican horror films: The Snake People, The Incredible Invasion, The Fear Chamber, and House of Evil. He also starred in Cauldron of Blood, in 1967 alongside Viveca Lindfors. British novelist, short story writer, poet, fighter pilot & screenwriter Roald Dahl sadly passed away on 23rd November 1990 at the age of 74 of a blood disease, myelodysplastic syndrome, in Oxford, and was buried in the cemetery at St Peter and St Paul’s Church in Great Missenden, Buckinghamshire, England. Born 13 September 1916 in Llandaff, Cardiff, Wales. He was named after the polar explorer Roald Amundsen. Dahl first attended The Cathedral School, Llandaff. Thereafter, he transferred to Saint Peter’s Boarding School in Weston-super-Mare, and in 1929, he attended Repton School in Derbyshire, During his school years He was never seen as a particularly talented writer , although He excelled at sports, and was made captain of the school fives and squash teams, and also played football. As well as having a passion for literature, he also developed an interest in photography and often carried a camera with him. During his years at Repton, Cadbury’s, would occasionally send boxes of new chocolates to the school to be tested by the pupils. Dahl apparently used to dream of inventing a new chocolate bar that would win the praise of Mr. Cadbury himself; and this proved the inspiration for him to write Charlie and the Chocolate Factory, and include references to chocolate in other books. His first job of selling kerosene in Midsomer Norton and surrounding villages in Somerset, south West England is also a subject in Boy: Tales of Childhood. After finishing his schooling, he went hiking through Newfoundland with the Public Schools’ Exploring Society and in July 1934, joined the Shell Petroleum Company, & after two years of training, he was transferred to first Mombasa, Kenya, then to Dar-es-Salaam, Tanzania. In August 1939, as World War II loomed, plans were made to round up the hundreds of Germans in Dar-es-Salaam. Dahl was made an officer in the King’s African Rifles, commanding a platoon of Askaris, indigenous troops serving in the colonial army. In November 1939, Dahl joined the Royal Air Force as an Aircraftman and was promoted to Leading Aircraftman on 24 August 1940. Following six months’ training on Hawker Harts, Dahl was made an Acting Pilot Officer. He was assigned to No. 80 Squadron RAF flying obsolete Gloster Gladiator biplanes, but did not receive any specialised training in aerial combat, or in flying Gladiators. Sadly during one mission, he was forced to attempt a landing in the desert because he was running low on fuel and night was approaching, unfortunately the undercarriage hit a boulder causing the aircraft to crash, fracturing his skull, smashing his nose and temporarily blinding him. luckily He managed to drag himself away from the blazing wreckage and passed out and was rescued and taken to a first-aid post in Mersa Matruh, then taken by train to the Royal Navy hospital in Alexandria. After his recovery, Dahl took part in the “Battle of Athens”,On 20 April 1941, alongside the highest-scoring British Commonwealth ace of World War II, Pat Pattle. In May, Dahl was evacuated to Egypt and flew sorties every day for four weeks, shooting down a Vichy French Air Force Potez 63 and a Ju-88, but he then began to get severe headaches that caused him to black out, so He was invalided home to Britain. Though at this time Dahl was only a Pilot Officer on probation, in September 1941 he was simultaneously confirmed as a Pilot Officer and promoted to war substantive Flying Officer.Dahl began writing in 1942, after he was transferred to Washington, D.C. as Assistant Air Attaché. His first published work was “Shot Down Over Libya” which described the crash of his Gloster Gladiator. C. S. Forester also asked Dahl to write down some RAF anecdotes so that he could shape them into a story. After Forester read what Dahl had given him, he decided to publish the story exactly as Dahl had written it. The original title of the article was “A Piece of Cake” but the title was changed to sound more dramatic, despite the fact that he was not actually shot down. Dahl was promoted to Flight Lieutenant in August 1942. During the war, Forester worked for the British Information Service and was writing propaganda for the Allied cause, mainly for American consumption. This work introduced Dahl to espionage and the activities of the Canadian spymaster William Stephenson, During the war, Dahl supplied intelligence from Washington to Stephenson and his organisation known as British Security Coordination, which was part of MI6, where he worked with other well-known officers such as Ian Fleming and David Ogilvy. Upon the war’s conclusion, Dahl held the rank of a temporary Wing Commander (substantive Flight Lieutenant)in August 1946 he was invalided out of the RAF. He left the service with the substantive rank of Squadron Leader. His record of at least five aerial victories, qualifying him as a flying ace. After the war Dahl went on to become one of the world’s best-selling authors, writing works for both children and adults and has been referred to as “one of the greatest storytellers for children of the 20th century”. In 2008 The Times placed Dahl 16th on its list of “The 50 greatest British writers since 1945″. His short stories are known for their unexpected endings, and his children’s books for their unsentimental, often very dark humour. Some of his notable works include James and the Giant Peach, Charlie and the Chocolate Factory, Matilda, The Witches, Fantastic Mr Fox, The Twits, George’s Marvellous Medicine and The BFG. In the 1986 New Years Honours List, Dahl was offered the Order of the British Empire (OBE), but turned it down, purportedly because he wanted a knighthood so that his wife would be Lady Dahl. Dahl is the father of author Tessa Dahl and grandfather of author, cookbook writer and former model Sophie Dahl (after whom Sophie in The BFG is named).